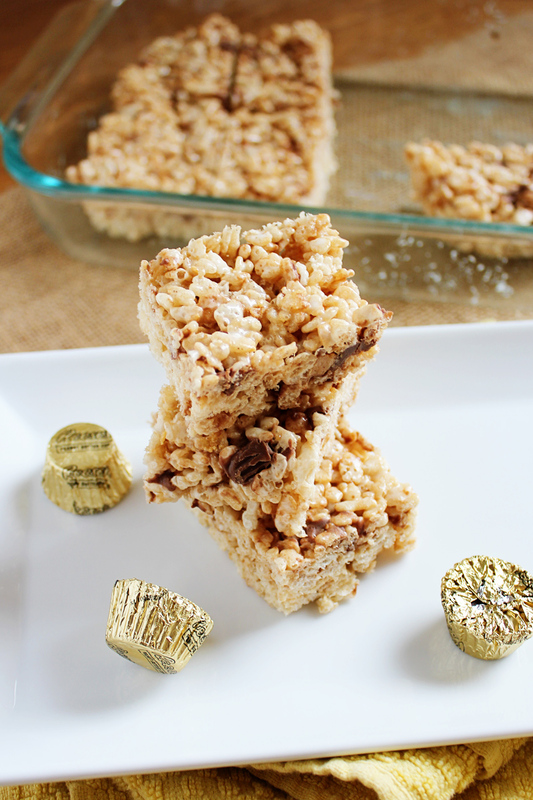 Reese’s Cup Rice Krispie Treats combine peanut butter and chocolate together in this classic dessert your whole family will love. Lately my posts have been a lot more savory and that’s ok, a girl’s gotta eat, but when it comes to matters of the heart (and stomach) sweets will always win out for sure. Yesterday at church I started teaching the 7 year old class, it was so much fun! Not really being sure of who or how many kids would show up I wanted to be prepared with a little something special to start our year off right. After a quick Facebook poll and a trip to Target Saturday night I made Rice Krispie Treats, but with a slight twist. They turned out delicious as always, with just a hint of peanut butter and chocolate. It’s no surprise they disappeared in minutes and the kids asked for seconds! Next time you need a quick dessert or snack to share but want to mix it up just a bit, I recommend giving these a try. Enjoy and happy no baking! In a large microwave safe bowl melt the butter on high for 45 seconds. Add the marshmallows, toss to coat and microwave for 45 seconds, stir and microwave another 45 seconds. In a large bowl combine the cereal and marshmallow mixture. When it almost comes together toss in the chopped Reese's cups and press into a greased 9"x13" pan. Cool completely, cut into squares and serve. Looks delicious! I like your variation of the standard rice crispy treats. Thank you for sharing your recipe on Foodie Friends Friday Linky Party this week. Please remember to link your recipe back to http://www.foodiefriendsfriday.com and come back on Sunday to vote for your favorite recipes! I’m all in when it comes to peanut butter cups! They are my biggest weakness!!! Love these yummy krispie treats!! !